Happy Fall, Word Cafe readers! For me, it marks the beginning of conference season, and I’m just back from the Colorado Gold Conference from Rocky Mountain Fiction Writers. It’s always a top-notch event, but this year’s offering of workshops and panels was perhaps the best yet. I’ll give a quick overview of some themes and resources that resonated with me, and then I’ll zoom in on a vital topic for writers heading into submissions: subjectivity in the slush pile and the publishing industry. A couple of sessions that really stood out to me put the spotlight on diversity in fiction. They were “Writing the Basics of Queer Characters” by Charles Yoite, Emily Singer, and Cath Lauria; and debut MG author Judith Robbins Rose’s talk about writing characters from a different culture/background than your own. A theme that emerged in both sessions was the importance of including a broad array of experiences and viewpoints within what we consider “diverse characters,” in order to avoid what author Chimamanda Ngozi Adichie calls “the danger of a single story.” In other words, including a cisgender gay male character in your fiction (for example) does not begin to encompass the entire LGBTQ experience, just as writing about a young second generation Mexican girl from a tough neighborhood does not encapsulate “the Latino/a experience” in the U.S. If you’d like to explore this further, check out the website of the amazing We Need Diverse Books campaign. Now in its second year, the campaign has made great strides toward getting the publishing industry and our literature to more accurately reflect the diversity of this country (it focuses on the U.S. book market, but hopefully the message will go global!). Another dynamite workshop, “Tropes 101,” showed how to turn fictional tropes on their heads, and featured the team from the Beyond the Trope podcast. A few questions that arose: “Why do women warriors wear bikini-like armor–isn’t there a chance someone might try to stab the parts the armor doesn’t cover?” and “How can I subvert the ‘faithful dog/man’s best friend’ trope? (Answers from the brainstorming session: “Make the dog an alligator,” or “Let the dog think her master is an idiot.”) If you’re not acquainted with the podcast, I recommend it for excellent writing advice and a hearty dose of cerebral humor. In the world of publishing, it often comes down to individual tastes and opinions. Elegant prose. They noticed when the writing was flowing beautifully, and if it ever started to feel over-written or stilted, hands went up (the “stop reading” signal). Questions raised in the reader’s mind. There were cases where panelists said they might have stopped reading, had there not been a compelling question raised in those first two pages, ensuring they wanted to hear more in order to find out what would happen next. Trim, trim, trim. For at least half of the submissions, panelists recommended tightening the writing on the sentence or paragraph level. Several authors were told their story started in the wrong place; that they should trim the first couple of paragraphs, the first page and a half, etc. ; start the story in a more dynamic spot, and then weave in any relevant information from the cut material later. Some stories had an overload of descriptive language. Others contained too much thinking/ruminating from the main character, preventing the story from really taking off. Clarify who the main character is (in the context of the story) and help readers get to know her/him better, right off the bat. Some of the submissions had excellent prose, but the panelists were left with a vague notion of the POV character. More grounding was needed. Infuse the story with more emotion or a reason for the reader to care. Some of the submissions flowed nicely but left the audience feeling apathetic about the characters (often a precursor to yawning). Tackle the “So what?” factor early on. Now, here’s the kicker. Remember those four NYT bestsellers? Can you guess how they fared? The four published novels received reviews ranging from “good,” to lukewarm interest, to “no thanks.” None of them gave the impression of blowing the panelists away. Two received a stop sign from all or most of the panelists before the end of two pages. They were novels by…drum roll…Philippa Gregory and Nora Roberts. Yes, really! Are you surprised? I wasn’t. After hearing the samples, I agreed with those critiques and suggestions, but on a big-picture level, it’s something I’ve seen over and over in the publishing industry. In writing, as in any art form, beauty is in the eye of the beholder. Yes, there is such a thing as incontestable good writing, just as there is cringe-worthy writing. But in the middle is a vast gray area, where it often comes down to individual tastes, preferences, and opinions on the part of industry professionals. It has become an axiom: Every agent has rejected a book that went on to be a big hit. During this critique session, there was definitely overlap in the panelists’ feedback, but not a single submission received exactly the same assessment from all four agents/publishers. 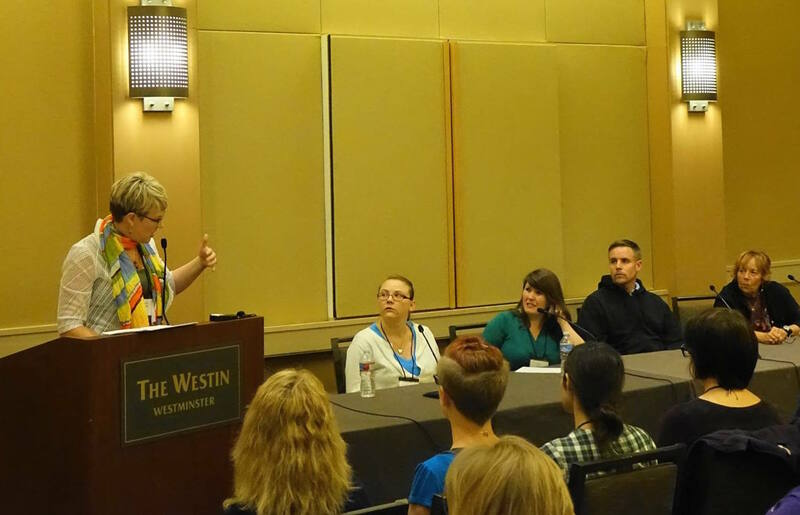 And though they appeared a little sheepish at rejecting those bestsellers, the panelists stuck to their guns and delivered what I think was the most important take-away: Publishing is a subjective business, and debut authors have the hardest road. You have to get your foot in the door and prove yourself before you’re allowed a few missteps or a saggy opening scene. Then, once you have established yourself as a master storyteller (AKA sold millions of copies), you just might get away with murder. My workshop at the conference was titled “A Layered Approach to Worldbuilding: The Macro, the Micro, & the Unseen.” You can read some of the content in this blog post.